We didn’t plan to feed the wild birds when we moved here twenty-five years ago. It’s just winter birds have such a hard time finding enough to eat when it snows. So I tossed out some scratch feed by the barn. Watching the birds was fun. Juncos, chickadees, sparrows and cardinals became regulars every morning. Shortly after dawn the birds begin to gather watching and waiting. 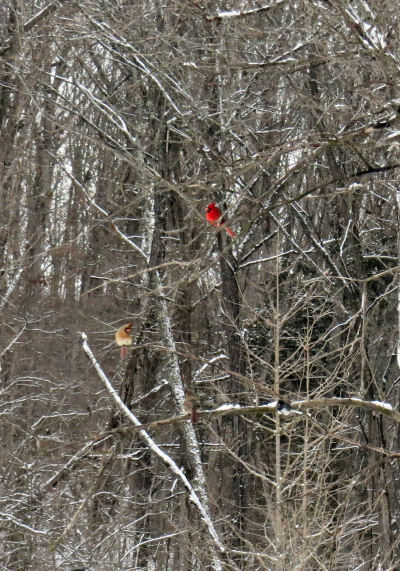 The cardinals are the easy ones to spot due to their size and color. There are mornings not a bird seems to be in sight. Yet, as soon as the tray of seeds is set out, they swoop in from all around. Winter birds are easier to see as they can’t hide behind the leaves. There’s a window in the kitchen looking out at the back yard. This was the perfect place for a feeder so we put up a platform. In the snow the tray was full of white stuff. In the rain the seeds went swimming. I built a roof. Over the years our feeder has never been fancy. The birds don’t seem to care. The big tray holds sunflower seeds. The dog dish holds scratch feed. A water pan is there when it won’t freeze. Otherwise the creek and a spring fed pond are close by. The local NPR station had a weekly bird commentary. Mike Doyan mentioned peanut butter. So we put out a lump on a half brick. This year we are trying some suet. It took weeks to get them to try it. The birds like cheap peanut butter better. They prefer cheap generic peanut butter to natural stuff. This newest feeder top has higher sides than the last one making it harder to see the birds. It is sturdier as high winds have come through the last few years blowing the roof off the feeder several times. The roof doesn’t look like much, but it does keep the rain and snow off the winter birds. Over the years the population of birds has changed and increased. We feed year round. Winter birds are still the favorites. Our winter birds now include mourning doves, cardinals, juncos, chickadees, sparrows, nuthatches, red-bellied woodpeckers, downy woodpeckers and purple finches. They line up on the feeder and in the nearby trees in the morning waiting for breakfast to arrive. And it does arrive. 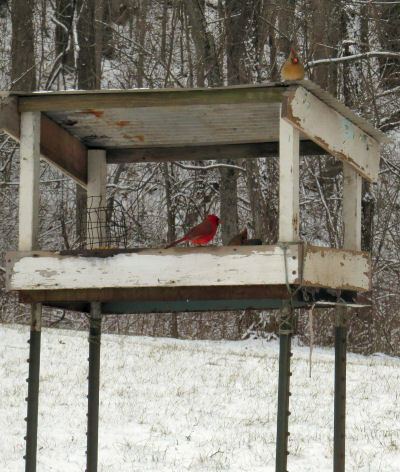 When snow is on the ground, the feeder is packed with birds coming and going. The sunflower seeds need replenishing in the afternoon. We have a new, larger kitchen window now. Standing there watching the feeder can delay meals. It is wonderful entertainment for us and a life saver for the winter birds. This entry was posted in High Reaches on January 23, 2019 by [email protected].